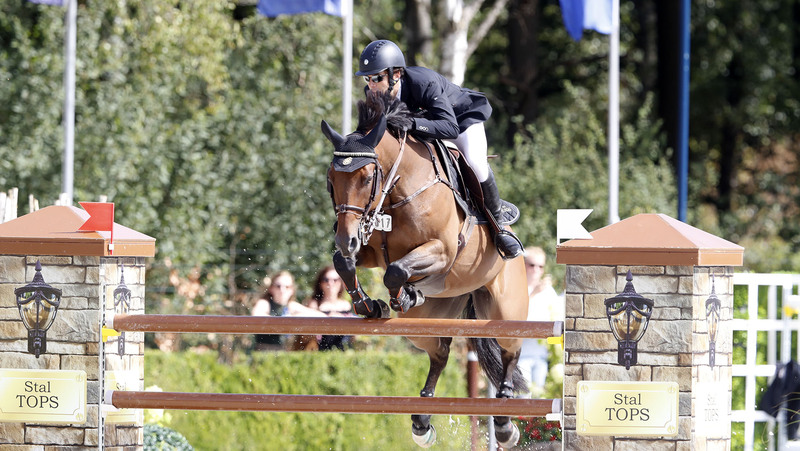 Eduardo Álvarez Aznar (ESP) and Uqualin du Saulcy flew to the win in the penultimate class of the Longines Global Champions Tour of Valkenswaard, taking victory in the 1.45m CSI5* speed class. The Spaniard impressed on the final day of competition at the Tops International Arena, leaving the rest of the international field in his wake, as temperatures soared in The Netherlands. The competition kicked off with a spark, as first rider to go - Longines Ambassador of Elegance Jane Richard Philips (SUI) - delivered a powerful clear with Izmir van de Baeyenne, throwing down the gauntlet with a time of 63.91s. She was quickly followed by young rider Evelina Tovek (SWE) and Oz de Breve, the pair impressive to watch but just a touch behind on the time. Leopold van Asten (NED) flew to the top of the timings with VDL Groep Beauty, the grey horse looking on better form after a disappointing couple of days. They set a new time to beat of 60.52s, almost four seconds fast from the rest of the field. As temperatures rose the pressure increased, with poles falling all over the field. Big names such as Ben Maher (GBR) with Don Vito, Christian Ahlmann (GER) with Take a Chance on me Z and Henrik von Eckermann (SWE) with Charlie Boy all picking up faults despite their best try of a fast clear. Others managed the clear, but couldn’t match the time set by the Spanish rider. Michael Whitaker (GBR) with Ambra, Gerco Schröder (NED) with Glock's Debalia, Luiz Felipe De Azevedo Filho (BRA) with Hermes van de Vrombautshoeve, Sergio Alvarez Moya (ESP) with Astoria Jo and Wout-Jan van der Schans (NED) with D' Angelo all on a clear score. But it was Eduardo who kept cool under pressure, sealing the win and taking the penultimate victory of the weekend.